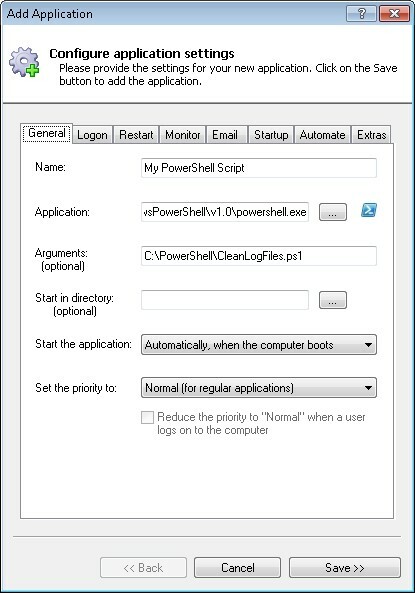 Start your PowerShell script (*.ps1) when your PC boots. Keep it running 24/7, or schedule it to re-run every few minutes. Windows PowerShell is Microsoft's powerfull command-line interface featuring built-in support for accessing WMI and COM objects. In the Arguments field, enter the full path to your PowerShell script. We have chosen our sample script, C:\PowerShell\CleanLogFiles.ps1. In the Name field, enter the name that you will call the application in AlwaysUp. We have used My PowerShell Script but you can specify virtually anything you like. Click over to the LogOn tab and enter the user name and password of the account that can run the script normally. This is particularly important if your script accesses resources that are not available to every account. By default AlwaysUp will restart your PowerShell script immediately after it exits. If you want to run it periodically, go to the Restart tab and specify when AlwaysUp should kick off the script. We have setup our script to run every hour, on the hour. Click the Save >> button. In a couple of seconds, an application called My PowerShell Script will show up in the AlwaysUp window. It is not yet running though. 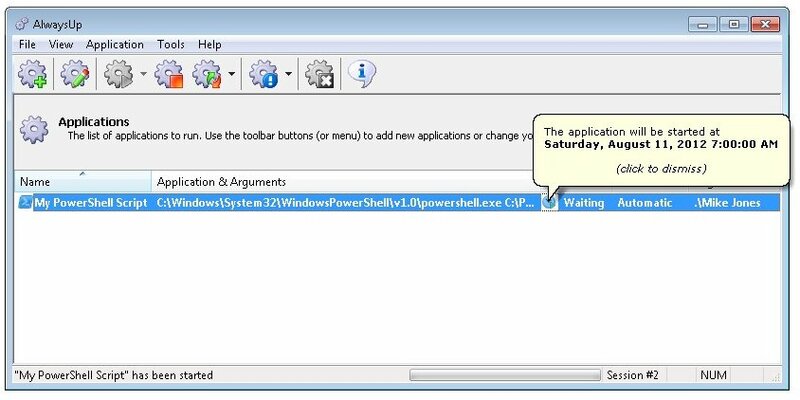 To run the script, choose Application > Start "My PowerShell Script". 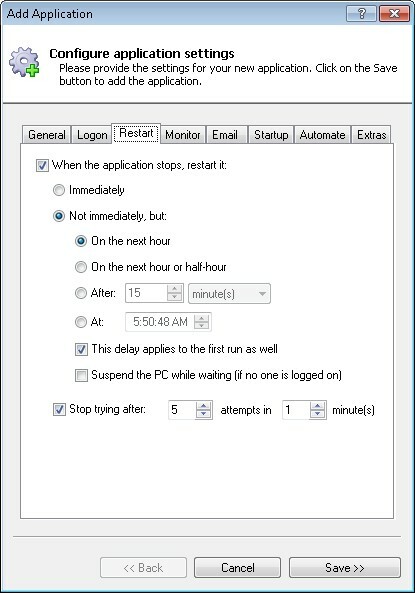 Note that it will not start until the next hour, as configured. The PowerShell script is currently running in Session 0. On Windows XP and Server 2003, you can see it by logging on to that session. 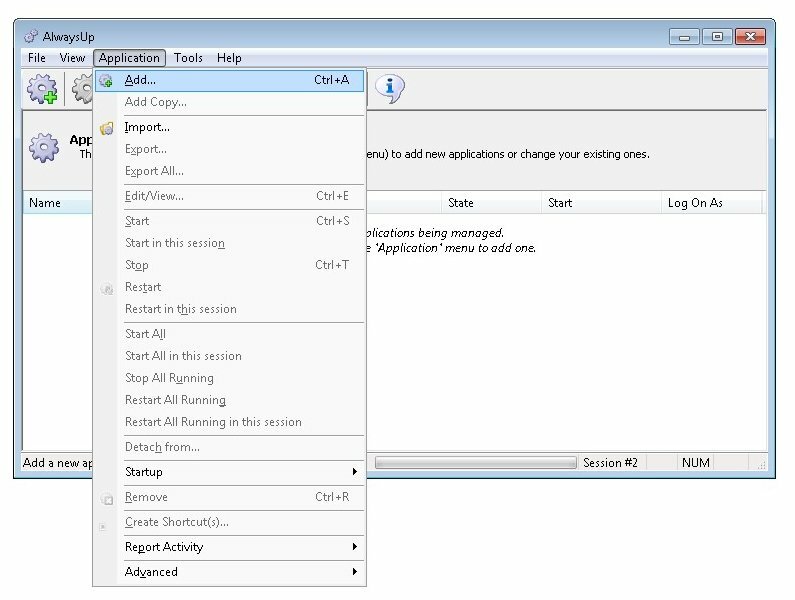 On Windows 7, Vista and Server 2008, you can see it if we go to Session 0 by selecting Tools > Switch to Session 0. That's it! Next time your computer boots, the PowerShell script will be launched immediately, before anyone logs on. We encourage you to explore the many other settings that may be appropriate for your environment. PowerShell Script not working properly as a Windows Service?